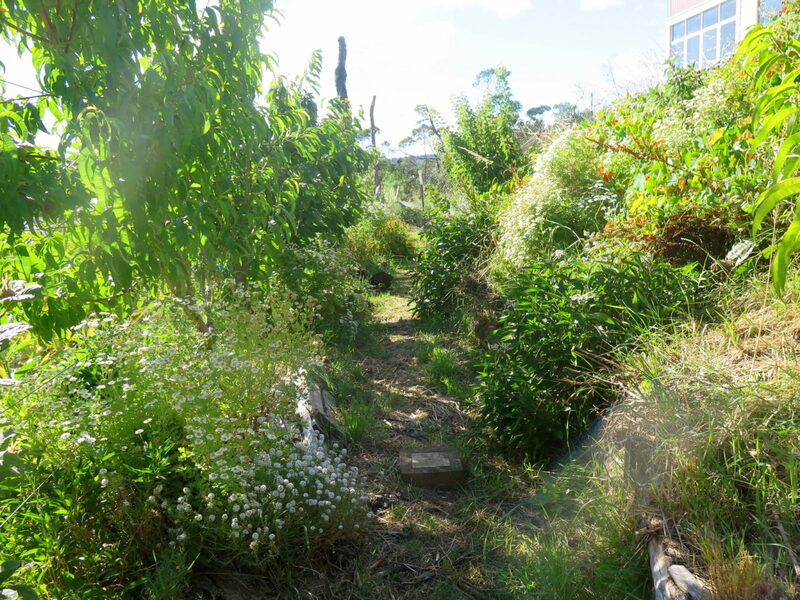 We held our latest permaculture design course in the very wonderful Okines Community House and Garden in Dodges Ferry. While there, we had the opportunity to integrate our already planned mushroom garden workshop into the design for their greywater system for the garden’s kitchen. 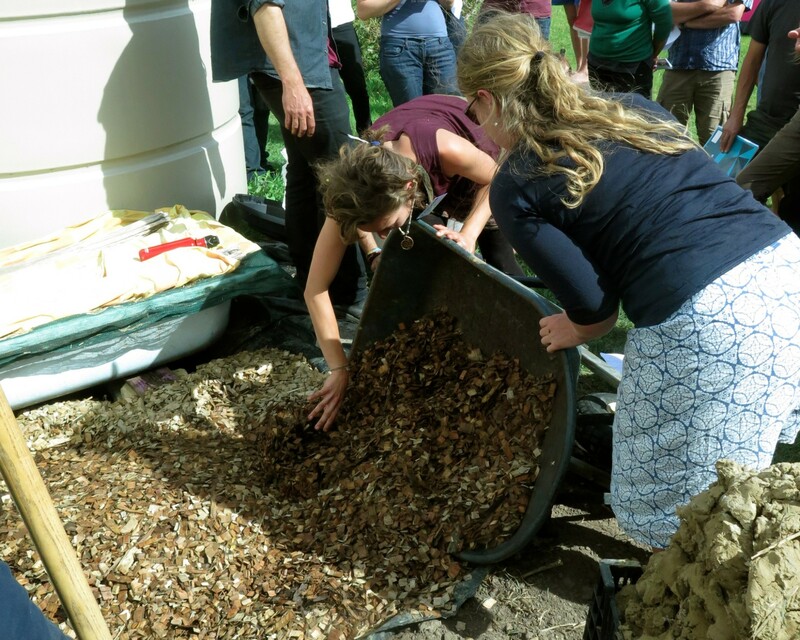 Our guest teacher, Nick Ritar from Milkwood suggested we integrate a worm farm, the mushroom garden and the greywater into one – creating *one* system as opposed to three separate ones. Stacking a number of functions and techniques into one system is a key element of permaculture design and is something we’re always looking to do. 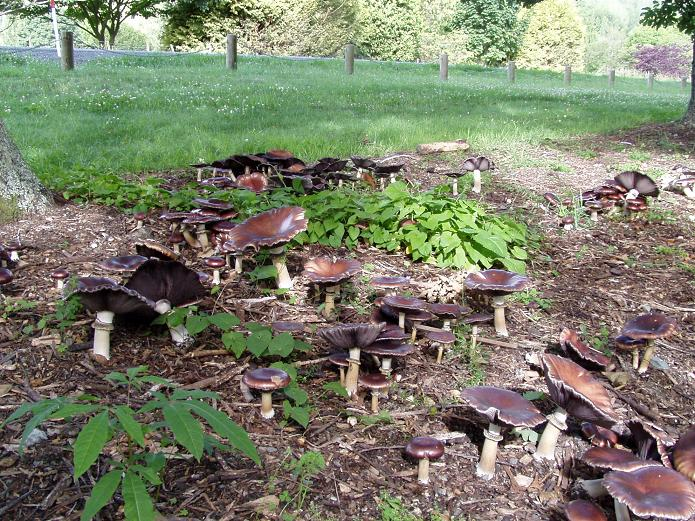 The mushroom garden is focused on growing the edible mushroom, Stropharia rugosoannulata, commonly known as the wine cap stropharia, “garden giant”, burgundy mushroom or king stropharia. The diagram above is a great guideline to follow. We didn’t follow this exactly due to having a limited amount of spawn. Image via Nick Ritar. 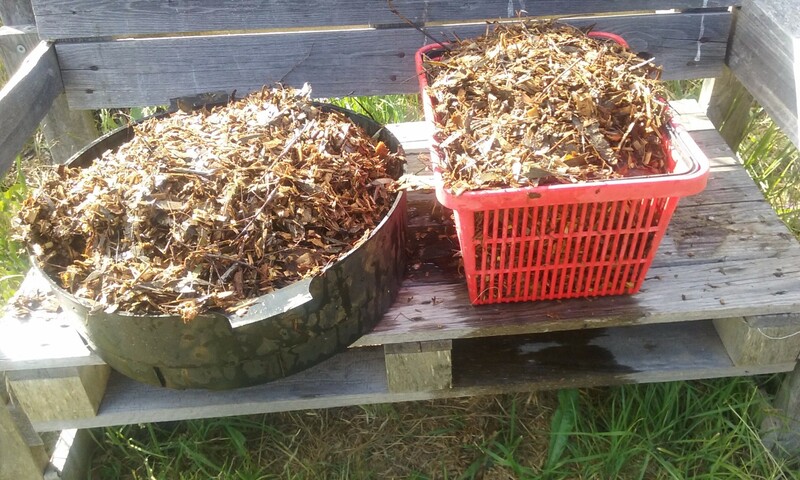 Soak at least one 44 gallon drum of woodchips for week, these need to be hardwood chips from either gum trees, oaks, poplar or fruit trees. 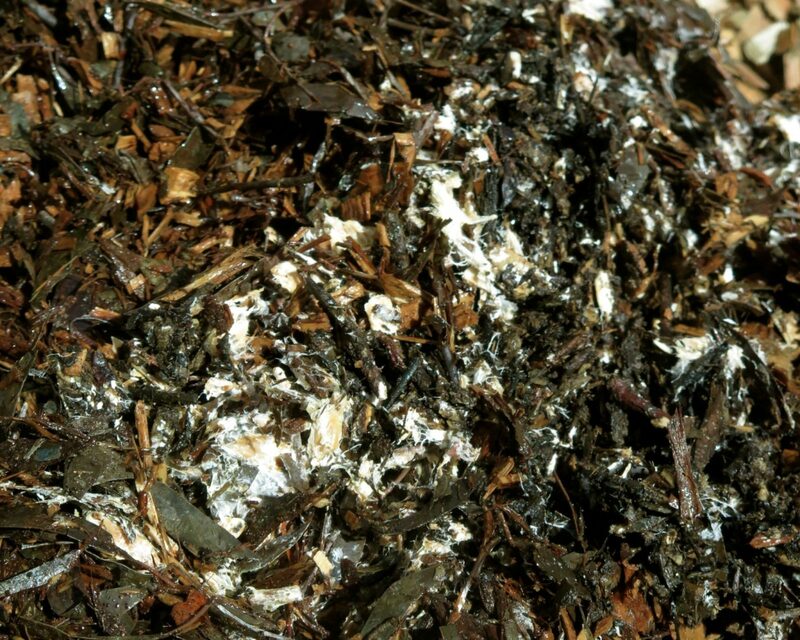 Importantly don’t use any woodchips from conifer/pine trees. 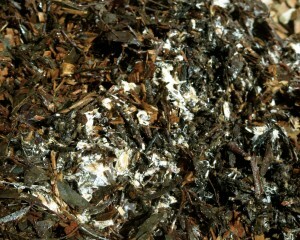 You can see our mix below has quite a lot of gum leaf in there, this isn’t ideal but will still work. 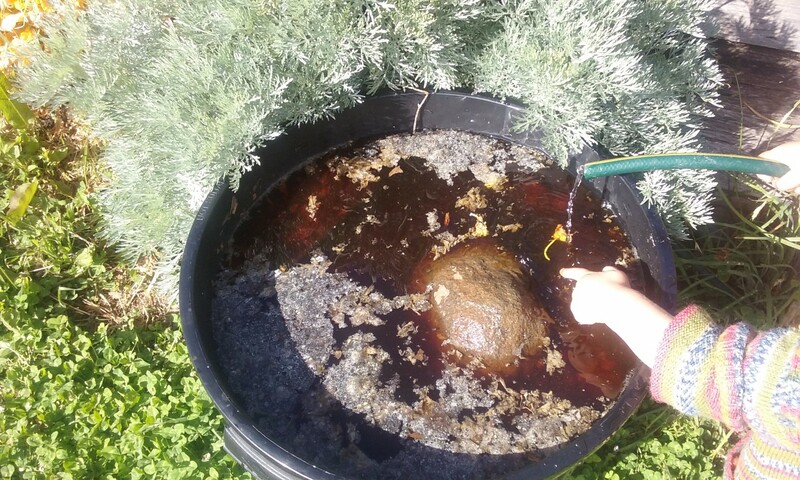 To make sure all the woodchips are submerged under the water place some mesh and a rock/brick on top as seen below. Over the one week, you’ll see the water turn a dark brown (that’s healthy) and an anaerobic smell will appear (also normal). The next step is to drain the woodchips completely so there’s no obvious pooling of water. I put all the woodchips into a couple of free draining baskets for around 10mts for this to happen. 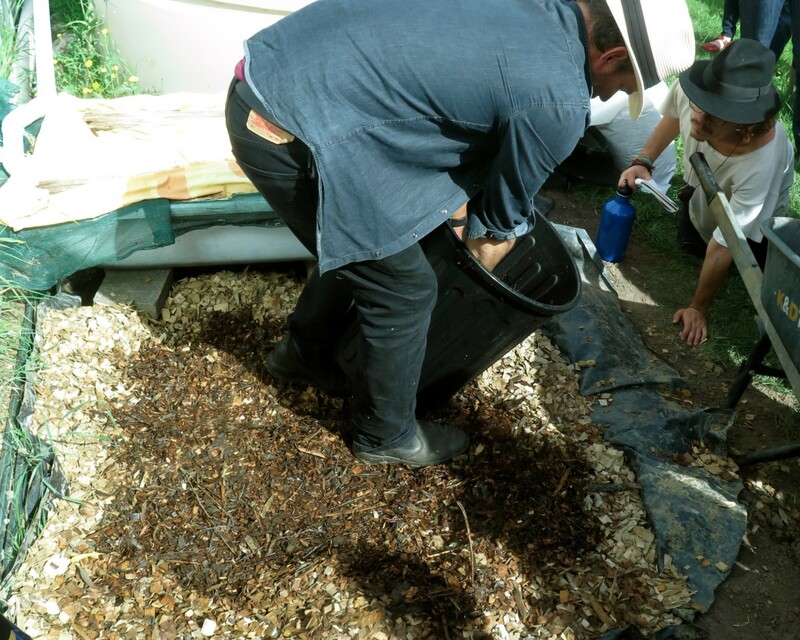 Then put half of the woodchips back in the bucket, add the mature spawn to the bucket and fill the bucket with the remaining soaked woodchips. Finally, place the whole bucket in the shade for one month. Importantly, make sure this bucket has holes in the bottom so it can drain any pooling water out of the bucket. This will prevent the bottom section getting stinky (anaerobic). I didn’t do this and while it ultimately all worked out fine – this is something I’d do better next time. But where do you get the mature spawn from? We sourced ours from a good friend passionate about fungi. Where can you get it? 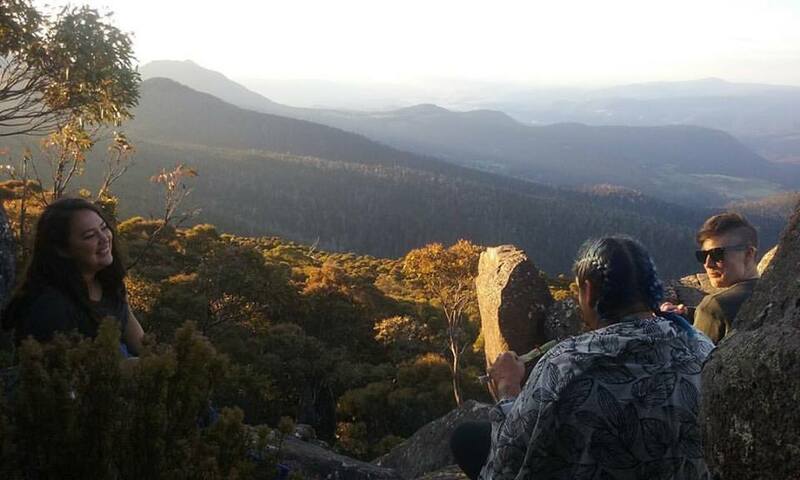 That will depend on where you live, touch base with your local mushroom networks, groups to find the best option. Once you have all your woodchips primed and the spawn in place for one month it’s time to bring it to its final destination – for us, this was the Okines Community Garden. 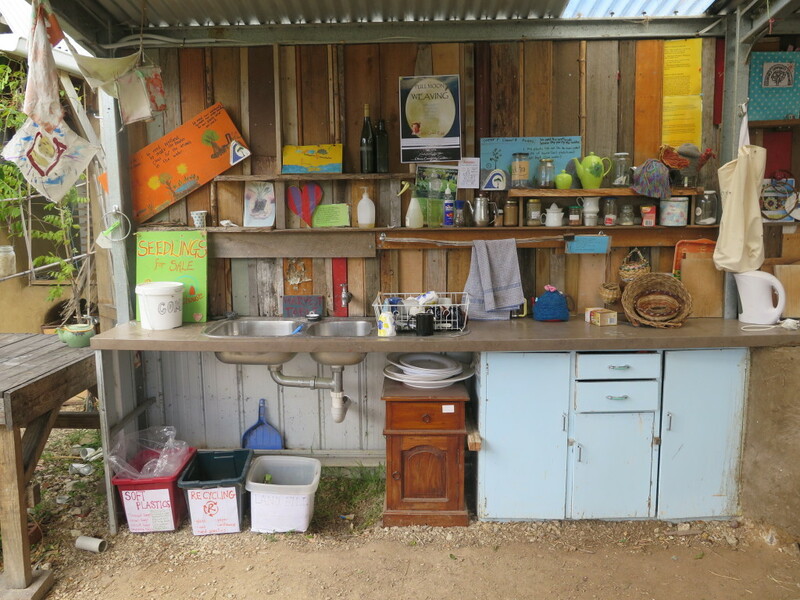 They were in the process of building a simple grey water system for their outdoor “garden kitchen”. For the past 5 or so years they’ve simply had a bucket under the kitchen sink which they emptied directly onto their gardens – it was time for an upgrade. The design was simple, plum the sink out the wall and into a low-tech worm farm grease trap in a recycled bath. 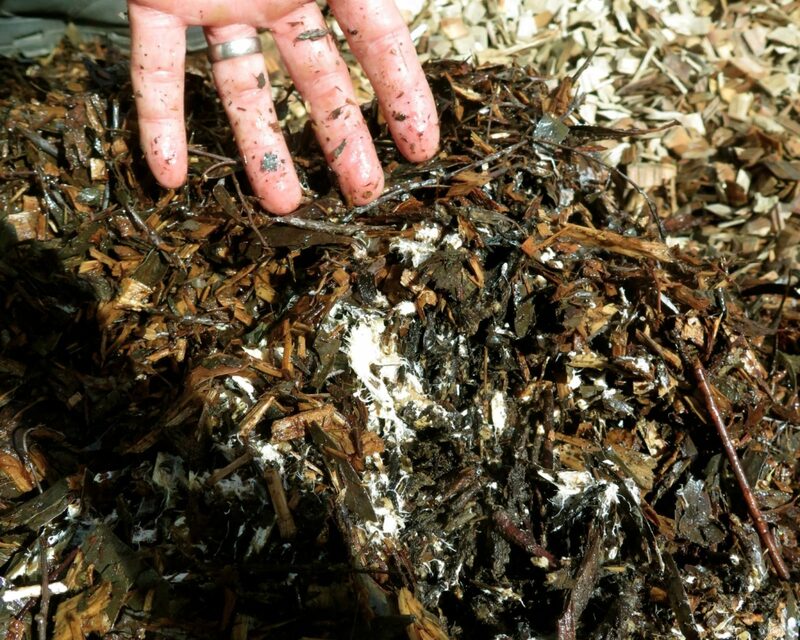 Compost worms love a nutrient-rich, highly moist environment – so this a kind of heaven for them. Just like any other worm farm it’ll need to be emptied every now and then, with the worm’s castings being used on the food gardens as a fertiliser. 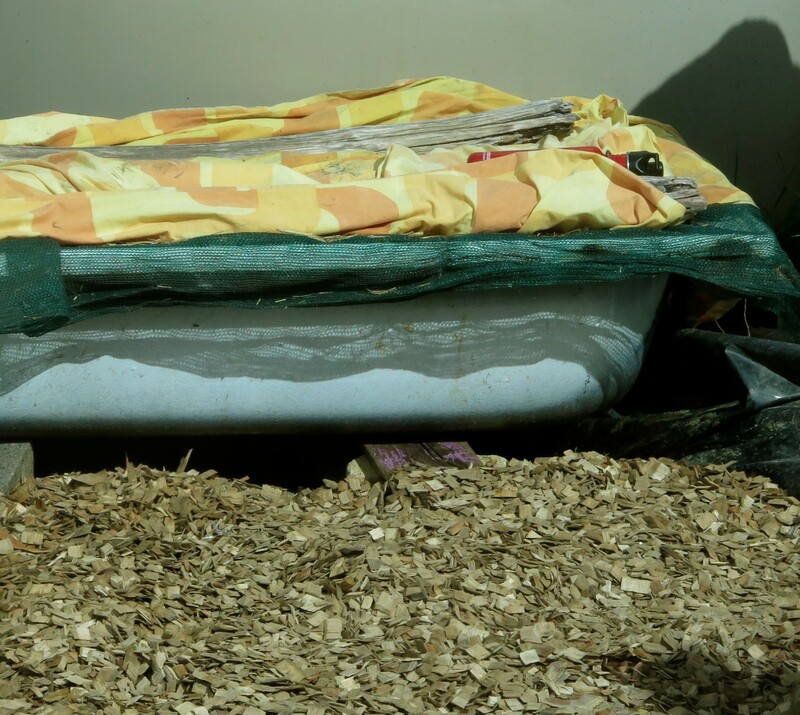 If you’re keen to know how to make a bathtub worm farm, have a read at one our earlier blogs here. 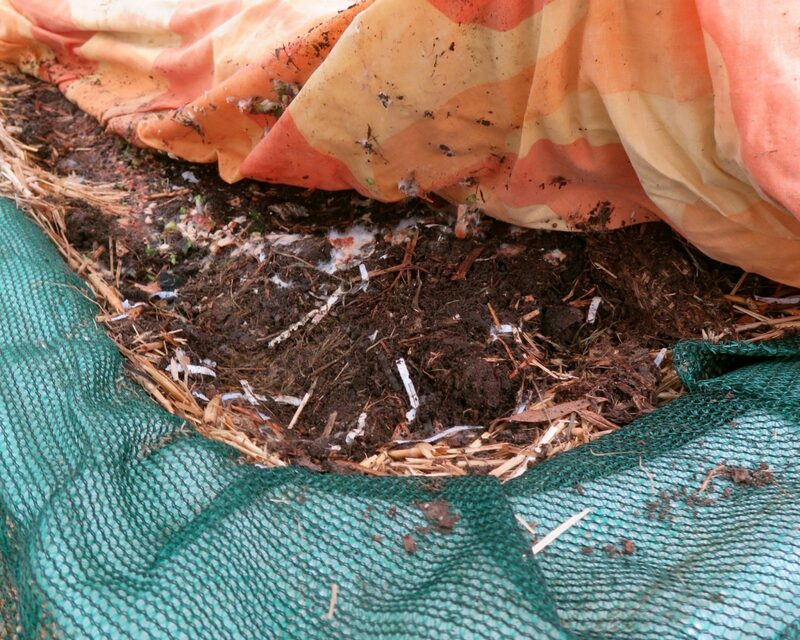 The worm farm’s drainage is directed straight into the woodchip pit – *this* is where the mushrooms will grow from. The pit is around 30cm deep and filled with pre-soaked gum woodchips (they were soaked for at least a few days before this point). As the soil is mostly sand here (they’re on the coast) we lined the hole with black plastic to retain moisture, preventing the mushroom garden from drying out. The plastic also has holes punched into it so excess water can slowly leave the system, preventing it from becoming waterlogged. If you had good clay, you could line the hole with a clay slip instead, you’d then have to monitor it and maintain it as needed to make sure it holds water sufficiently. This is where Nick took over by making a shallow hole in the existing woodchips and placed the inoculated woodchips in the middle. Straight away you could see how the white spawn had already started to slowly but surely spread through the woodchips. 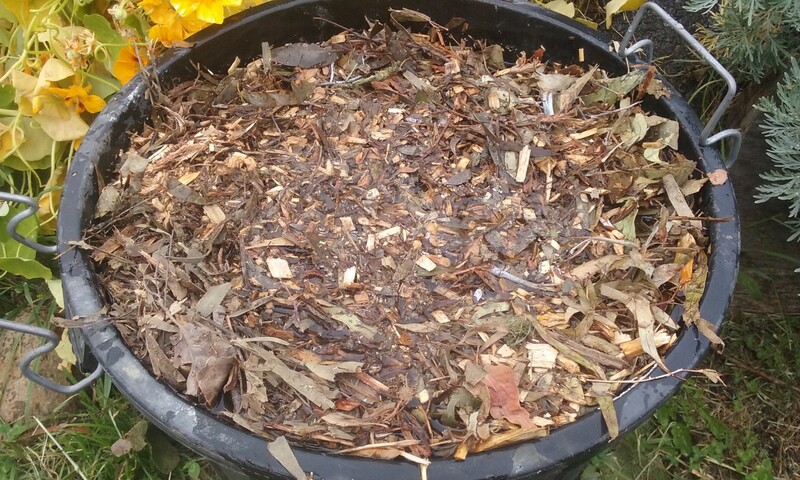 Finally, these woodchips were covered with additional (pre-soaked) gum woodchips – tucking them all in and making sure they don’t dry out. 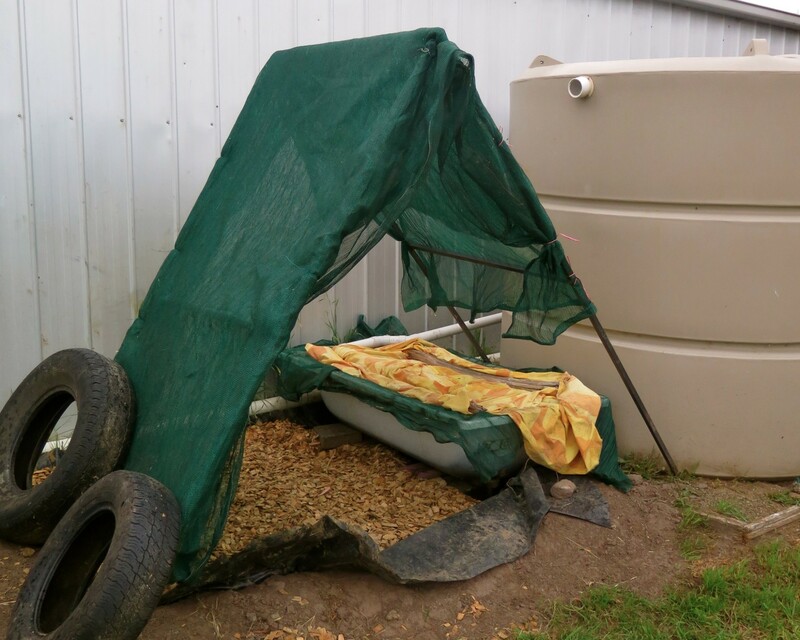 The garden coordinator’s Claire and Gabe then built a temporary shade structure to keep the hot afternoon sun off the woodchips, also preventing it from drying it out. Soon they’ll plant an ever-green shrub to provide this shade and add to the general beauty of the space. 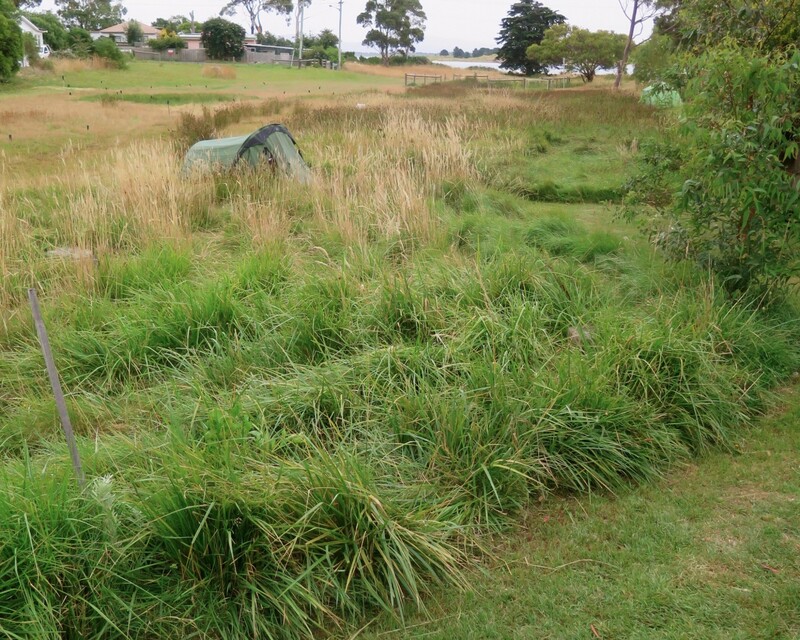 The overflow from this system all ends up in some grassland and then travels into the local wetland. The worm farm and mushroom garden are filtering strong nutrients out of the water before it gets here, ensuring there’s no heavy nutrients hitting this native ecosystem – keeping it happy and healthy. These types of low-tech techniques are brilliant for the right context. We’re really passionate about being able to “keep things real” with simple, safe and super effective systems like this one. 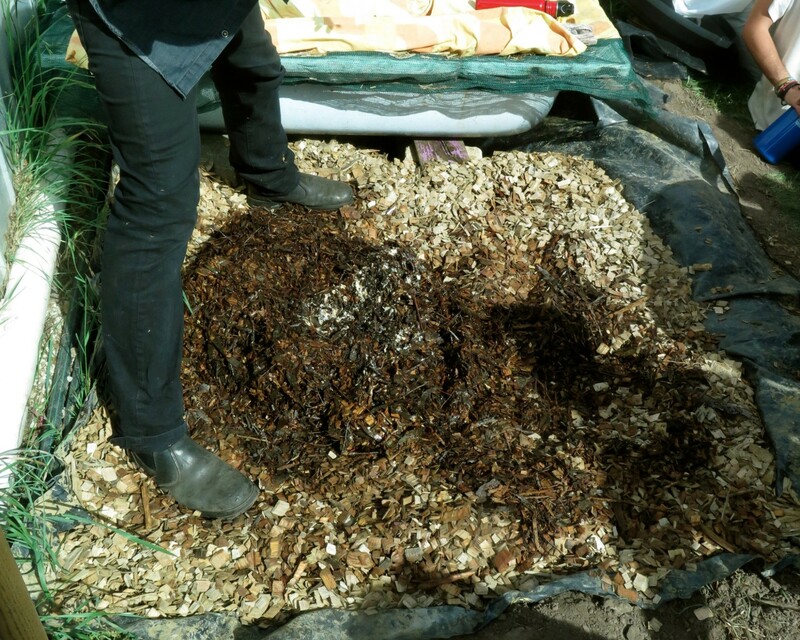 Nick says that by next year the whole woodchip pit will be alive with the garden giant mushroom’s spawn – and edible mushrooms. Very good. Very, very good. 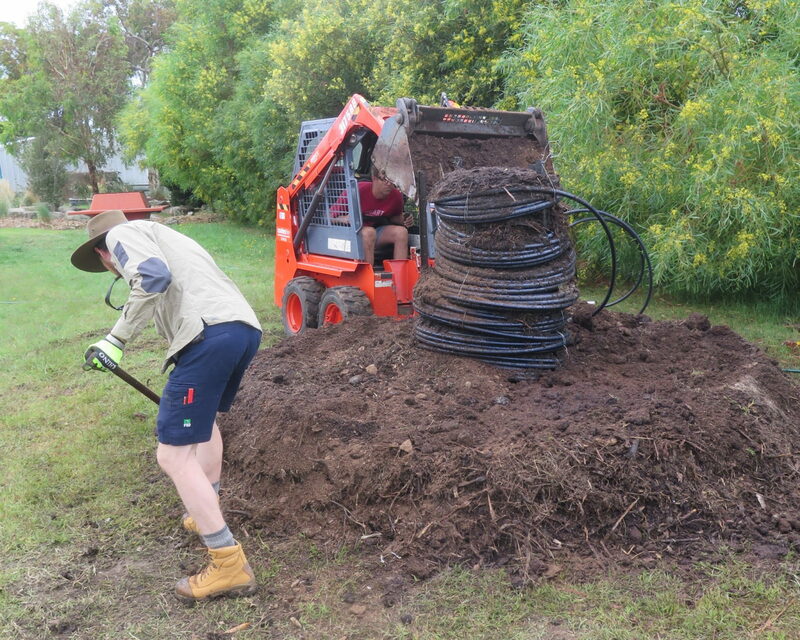 You can see a more permanent example of a greywater worm farm design in action at Melliodora here. 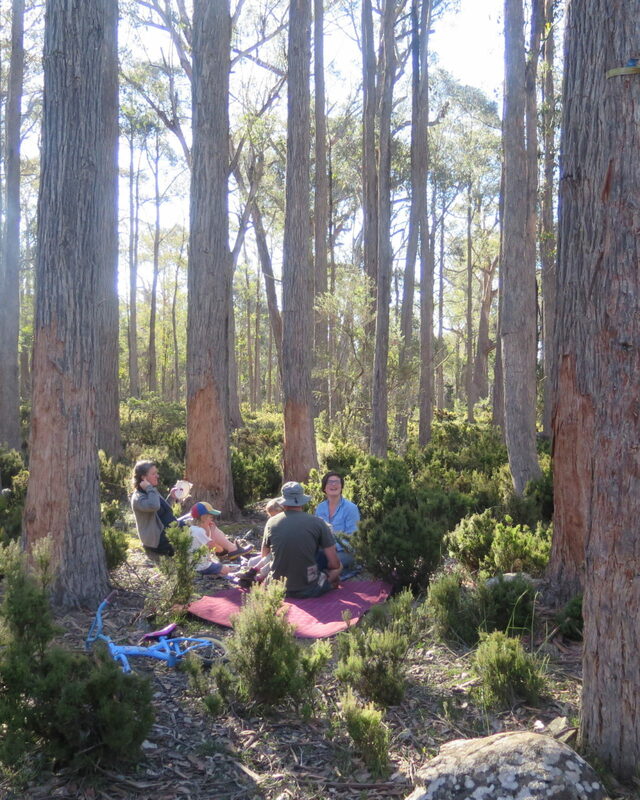 Get in touch with Forest Fungi for a range of resources. Hello 2017 and all you wonderful people out there. We’re a bit quiet on this blog at the moment – here’s why. 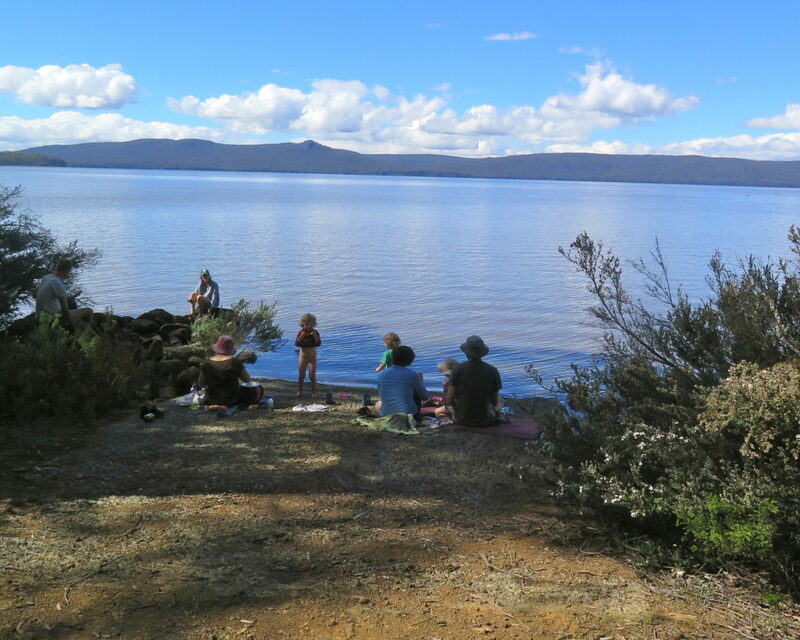 We started the year with a flurry of much needed camping trips with dear friends. Because even though life is very full with work commitments none of that can happen *well* unless we, and are little family, are happy. So happy we were and are. 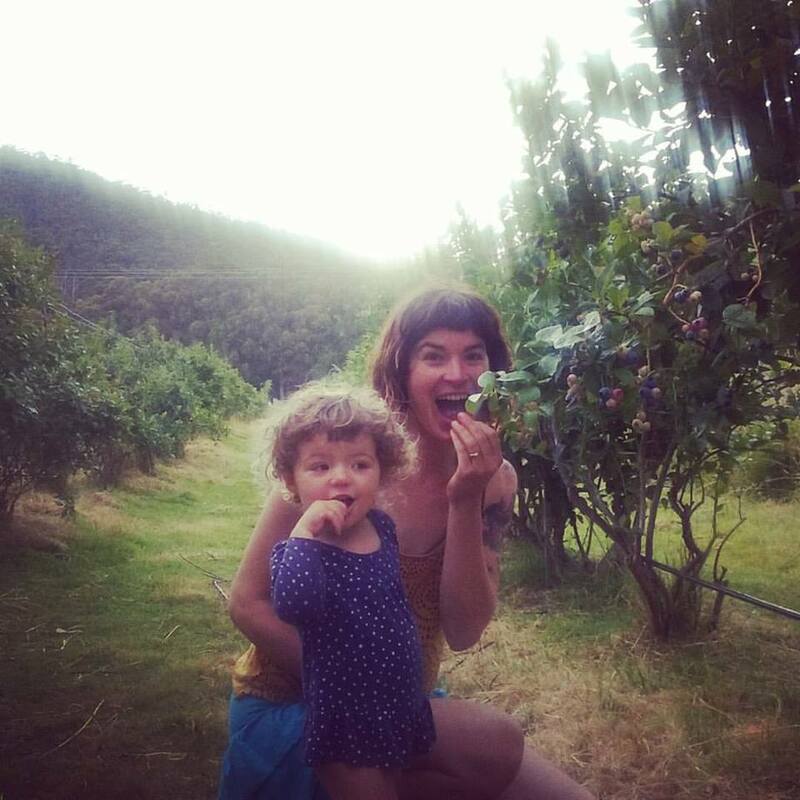 Frida turned two, so we went camping (again) – this time in our mate’s blueberry orchard to which she was forever grateful for and very well fed. And now? 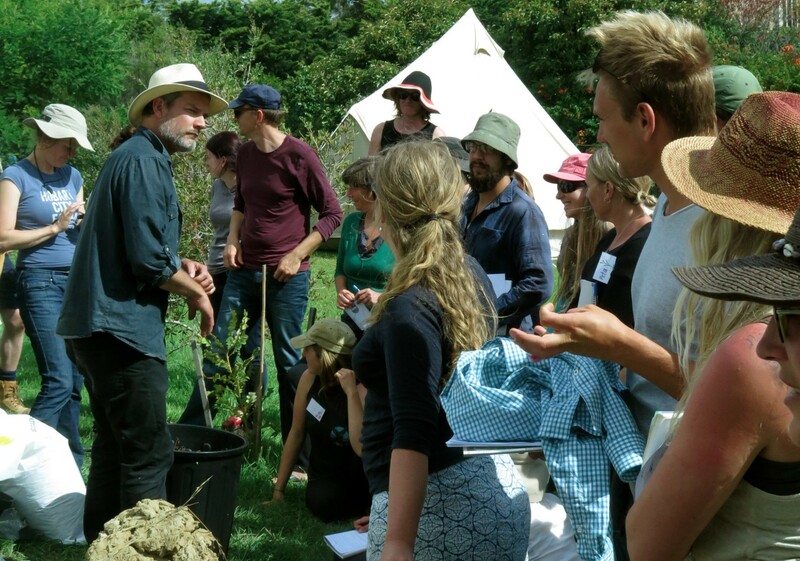 Now we are fully focused on prepping for our summer permaculture design course which starts this Friday! 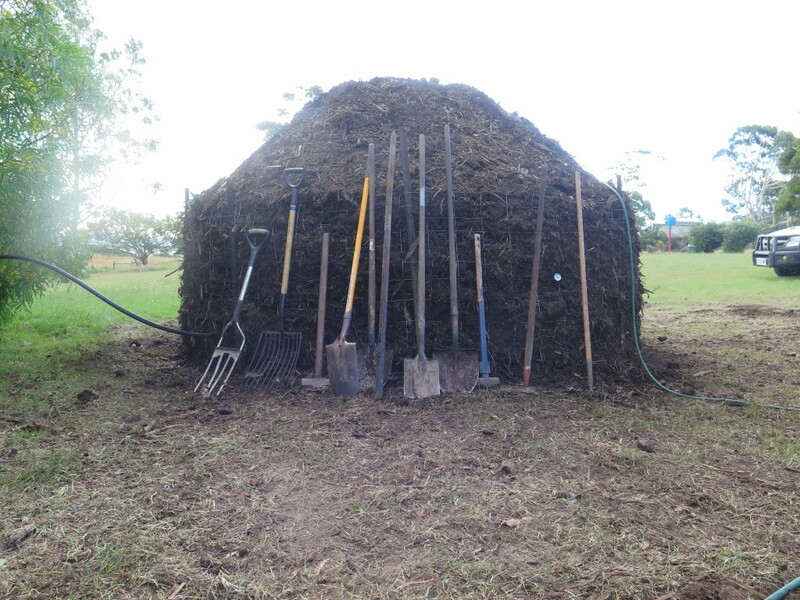 On top of the many, many small logistical details we have to sort out, we decided to build a hot compost shower system for the two-week course. It’s the first time we’ve done this – huge thanks to Very Edible Gardens for teaching us how via many emails. We love you for your generosity, brains and funny characters. We’ll write a comprehensive blog about this system in a few weeks once we’ve used it, learned what we did wrong and right so you can then learn from us. But right now, we think it’s one of the most beautiful things we’ve ever help create – 20 cubic metres of glorious organic matter! 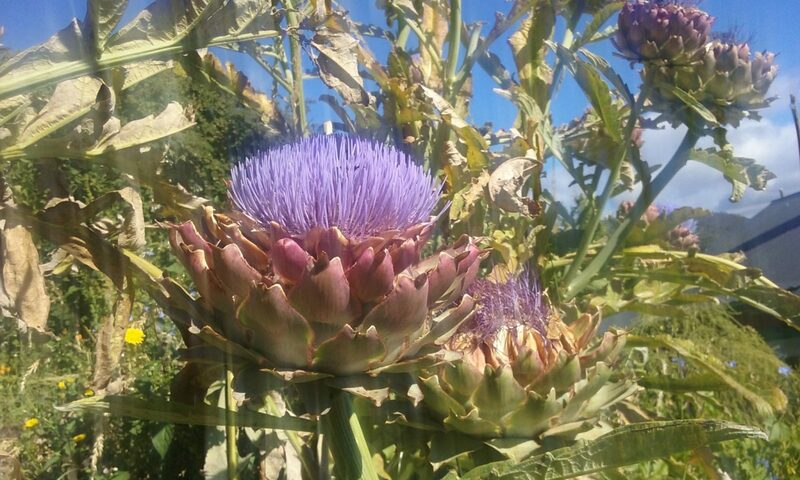 The perennial gardens/orchard are proving once again they are far superior than any annual gardens – pumping out the fruit, berries and wild greens while we make sure they have enough water. Weeding can wait as currently they’re helping reduce evaporation and provide fresh greens for our chooks. BECAUSE NEXT SEASON WE’LL HAVE A WHOLE NEW SPACE TO GROW INTO. Sorry to shout, but this development has been four years in planning/wishing/hoping. And now it’s all happening. As I write, an excavator is moving earth strategically (keeping the top soil safe) to create a series of terraces for our long-term annual beds and additional fruit/nut orchard with animal systems integrated. 2017 – you’re a big year, one we’ve been willing for – wanting to hurry up and get here so we can make so many of our garden/home/life dreams come true. We’re so happy you’re finally here, a touch overwhelmed with the enormity of it all but ultimately just deeply grateful and stoked.